The Sitting Volleyball Experience | Sunshine, Sitting Volleyball & Charity! 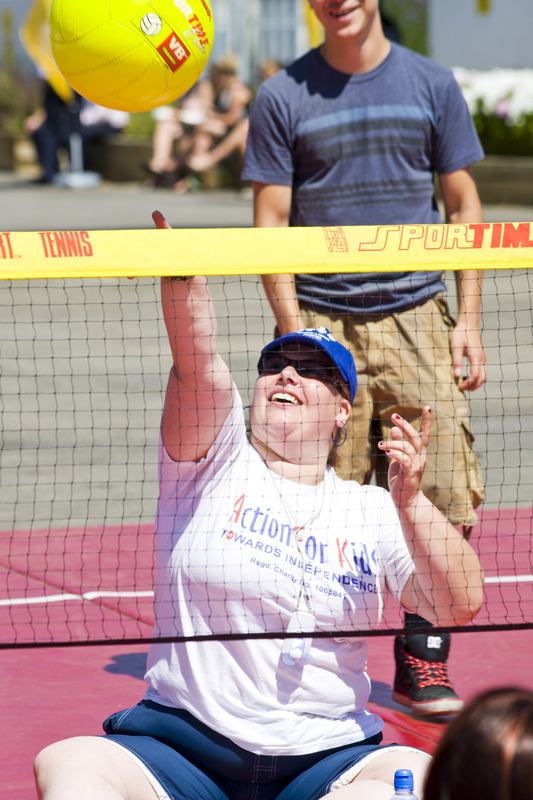 Sunshine, Sitting Volleyball & Charity! Following on from last weeks blog, I have been in London all week at the Action For Kids Beach Volleyball event at Canary Wharf. We have had local schools coming down all week, enjoying playing beach volleyball on the sand as well as playing some sitting volleyball. On Thursday, GB player Justin Phillips joined us, playing with the young people as well as answering their questions in a Q & A session over lunch. The big focus of the week has been the corporate beach volleyball competition which took place yesterday. Teams have been training all week and yesterday spent most of the day in the sunshine, playing on the beach and having a go of Sitting Volleyball. Special mention should go to the team from sponsors, Doyle Clayton who joined in sitting volleyball several times during the day as well as the Parthenon ‘Ark’ team who all played in their animal fancy dress! The day also gave the young people from the charity chance to come along and see the event as well as play some sitting volleyball. Talking to one of the girls who has been involved for a number of years was particularly inspiring, she explained how the charity had supported her over the years and what her aspirations are for the future. It really has been an incredible event to be involved with so a big thank you to everyone who supported it. To GB players Justin Phillips, Rob Richardson and John Worral who all came along to play, to Gary Beckford for supporting the coaching and most importantly to Action For Kids for delivering such a fantastic event – I hope you raised lots of money.